There is such focus on Google Maps, OpenStreetMap and projects like TileMill that you forget about the smaller elephant in the room (the one behind the Google elephant). 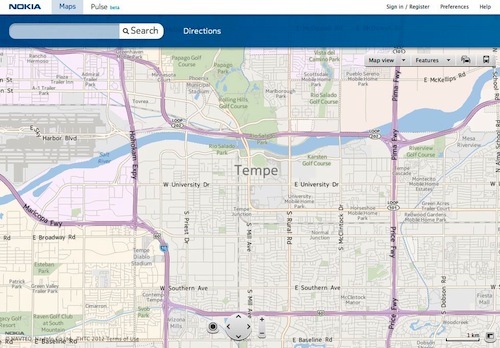 It looks like Bing Maps and Nokia are getting “unified”. Last year, we entered into a strategic partnership with Nokia which included plans to offer a unique and compelling mapping experience for our customers. Since then we’ve been working with Nokia and Windows Phone to deliver a unified map style based on one set of design principles with the goal of providing a more intuitive and pleasing online mapping experience. Our Bing Maps designers teamed closely with our partners at Nokia Maps and the Windows Phone team to unify our map elements, improve contrast and usability to ultimately create a more beautiful and functional map. Today we’re excited to share the new map design, available on desktop and mobile versions of Bing and Nokia maps. So it looks like both services will use the same background tiles and leverage the technologies that both bring to the table (including Navteq). A quick look at the tiles, at least on the desktop still show Bing Maps using the older style, but [Nokia Maps seems to be using](http://maps.nokia.com/# 33.4288021 -111.8618565 12 0 0 normal.day) what is described in the blog post above. I’ll be honest, I do like the new tiles as they are shown in Nokia Maps. There is just something about grey backgrounds that appeal to me. Now maybe Bing is going to roll out these new tiles soon, but for now you’ll need to use Nokia Maps to see what they are looking at. Even on my iPhone, I’m still seeing the older Bing Maps tiles.